Make a great easy fall crowd pleaser dessert. I have made thousands of pumpkin brûlées this time of year; an ideal seasonal treat. The custards can be made in advance and refrigerated, actually improving the pumpkin custard flavor. However, burn the sugar just before serving to keep the sugar crisp and crunchy. And, what a show stopper for your guests when you torch the sugar. Enjoy! In a medium saucepan, combine the milk, cream, pumpkin puree, orange zest, and vanilla and bring to a boil, stirring constantly, then remove from heat. In the top of a double boiler, combine the egg yolks, brown sugar, granulated sugar, corn syrup, cinnamon, nutmeg, and allspice, and cook until the mixture is lemon colored and coats a spoon abut 4-5 minutes. Slowly add the pumpkin mixture and continue cooking until the mixture has the consistency of thick custard, about 3-4 minutes. Remove the pan from the heat and pour into eight 4-ounce ramekins or tart shells. Chill 5-6 hours. 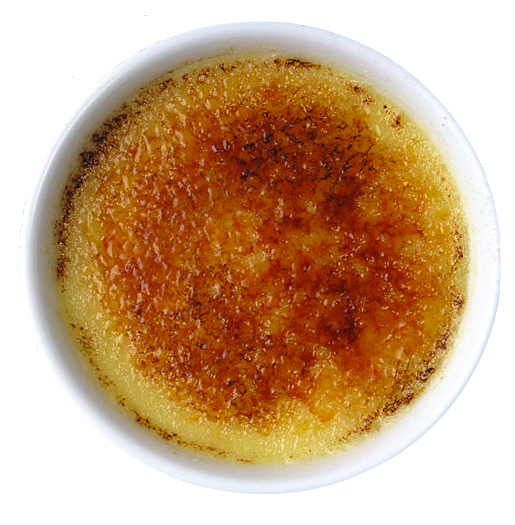 In a small bowl, combine the brulee sugars and cinnamon for the topping. Just before serving, top each custard with 1 Tablespoon of the sugar mixture. Light a butane torch to burn the sugar—moving the flame back and forth over the sugar until it darkens. Do not overheat or the custard will melt. Or, pre heat the oven broiler, and watch carefully so the pumpkin custards don’t burn. I bought a jar of our locally made honey by Don Sausser Apiaries, a necessary ingredient for today's recipe post. This is one of those cake recipes you can whip up as an impromptu dessert and now that the holidays are here, a special homemade gift from your home kitchen. Those are the best kinds of gifts! Lightly grease and flour bottom and sides of a 9-inch pan. In medium bowl, blend orange juice, honey, butter, egg yolks and orange peel; set aside. In large bowl, combine flour, granulated sugar, baking powder and baking soda; set aside. In small bowl, beat egg whites until soft peaks form. Mix orange juice mixture into flour mixture until blended. Gently fold in egg whites. Turn into prepared pan. Bake 35 minutes or until toothpick inserted in center comes out clean. Cool in pan for 10 minutes, then remove from pan and serve warm or cool 10 minutes on a wire rack until cooled completely. Just before serving, sprinkle with confectioners sugar. To serve, cut into wedges and garnish, if desired, with peeled orange wedges and whipped cream.